TOMAKOMAI, HOKKAIDO - With many dairy farmers in Hokkaido forced to dump thousands of liters of fresh milk following power outages and a scarcity of water triggered by the powerful earthquake on Sept. 6, local communities are trying to overcome the hardship by banding together. “Because a milk shipment factory stopped operating due to the power outage after the quake, I had to throw away 4,000 liters of fresh milk that had been stored in cooler tanks,” Takamitsu Igarashi, the owner of a dairy farm in the city of Tomakomai, said during an interview with The Japan Times on Tuesday. Milk, which is around 30 degrees Celsius when extracted from dairy cows, has to be stored at temperatures under 5 degrees Celsius. Anything above that temperature would allow bacteria to spread inside storage tanks, making the milk undrinkable, Igarashi said. Cows also have to be milked every 12 hours or they will develop diseases and sometimes even die. Igarashi was probably better prepared for disasters than many of his peers. Learning from the Great East Japan Earthquake in 2011, which heavily disrupted the electricity supply across Japan, he had purchased a private power generator and only had to dispose of milk produced in the two days following the deadly magnitude 6.7 quake that rocked the northern prefecture. Igarashi even allowed his power generator to be used by others who needed to operate their milking machines until electricity was restored Saturday afternoon. “Usually milking has to be done around the same time … but since there were not enough power generators, some dairy farmers who usually do milking at 5 a.m. had to wait until 3 p.m.,” Igarashi said, noting that the failure to milk cows on schedule can cause their udders to become bloated, leading to inflammation and infection. 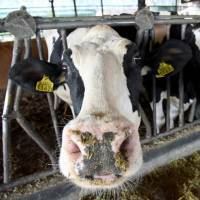 But even after the electricity was restored, a lack of clean water has continued to pose a serious problem for dairy farmers, as they need to give cows about 100 liters of water every day and have not been able to clean the already bacteria-tainted storage tanks, Igarashi said. Water has been delivered by truck to the quake-hit areas, including Tomakomai, where two people died, but the amount is not enough for the dairy industry. Tomoyuki Yamate, a veterinarian who was visiting Igarashi’s farm to check the condition of the livestock there, said Tuesday that about 10 animals have shown symptoms of dehydration in Tomakomai and the adjacent towns of Abira and Atsuma. Yamate, whose hospital is in Abira, added that medicine is also running short and that the delivery of medical supplies is difficult as some roads have closed after the quake. The quake has also damaged cowsheds, leading farmers in Abira to evacuate their cows to a nearby facility owned by a livestock market. Around 190 cows were being sheltered there as of noon Tuesday, a spokesman said. 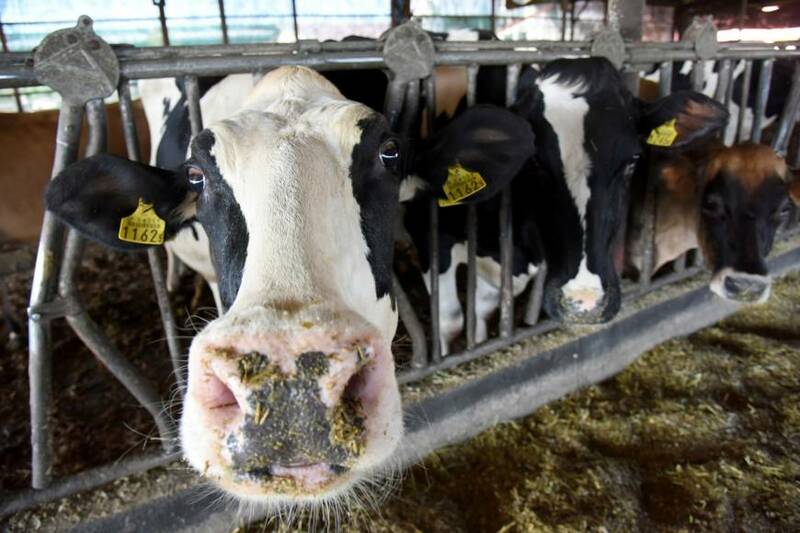 The quake was an additional blow to the farmers who had seen their cowsheds damaged by Typhoon Jebi, which devastated parts of western Japan and also affected Hokkaido the same week. “I was repairing the cowshed roofs, some of which had been blown off by the typhoon — then the strong quake hit,” said Igarashi. Some farmers were too busy to be interviewed, with the owner of Kohanawa farm in Abira saying he was occupied with repair work. Adrian Sakuma, a New Zealander and the owner of the farm, said the treadmill for horse training could not be used during the power outage. Sakuma said they had been able to get sufficient water for the total of 50 horses on his farm, which consume 50 liters daily, thanks to support from his peers and others. “People in the city have been really helpful to us, delivering water and such,” he said. Igarashi said the two consecutive disasters were terrible, but that things would have been much worse had the quake hit a month before or after. “In summer, we must use cooling fans to keep the cows from overheating, and in winter, electric heaters are a must to keep water from freezing. “In either of those cases, the quake would have caused severe damage to the cows and the potential impact on my business would have been horrible,” he explained. The milk dumping after the quake seems to have also affected consumers. “All milk products, eggs and bread are gone. I could not find any at the convenience store,” said Yasuhiro Watanabe, who was at his home in Abira when the quake hit. He is currently staying at his brother’s house in Chitose. Even in Sapporo, dairy product shortages have been noticeable. On Tuesday, shelves usually home to milk products at a convenience store were empty, and a notification showed that the products would not be stocked until further notice. Lieke van Vroonhoven, a 29-year-old native of the Netherlands who moved to Sapporo with her husband just a month ago, said she still sees many product shortages in the city. Megmilk Snow Brand Co., a major dairy producer, said a milk factory in Sapporo restarted operations Sunday. But it said it is putting priority on delivering milk to schools and has been unable to deliver the dairy products to supermarkets in the amounts that have been requested.